The Society publishes two periodicals. 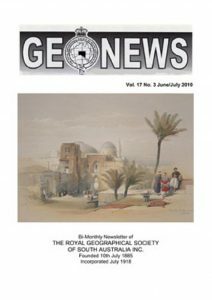 GeoNews (see below); and the South Australian Geographical Journal, published annually, which contains research papers on the geography of South Australia. Both magazines are provided to members as part of their subscription. GeoNews is published six times a year, and has articles on South Australia and Society events. The first issue of GeoNews features the story of William Coulthard and his tragic death in 1858 while exploring west of Port Augusta. His last poignant thoughts, before succumbing to thirst, are scratched on the side of his water canteen. The canteen is housed in the Society’s relic collection. Other issues of GeoNews include articles on many notable people including Madigan, Hurley, Todd, Stuart etc. as well as those of lesser fame. Reference to May 2000 issue will lead to a series on women travellers in Australia. GeoNews was first published in 1994 and there is now a large index of over 7,000 entries, which can be searched and is printable as a PDF (500+ pp). Click here to view the database index. Copyright 2018 Royal Geographical Society of South Australia Inc. All rights reserved.